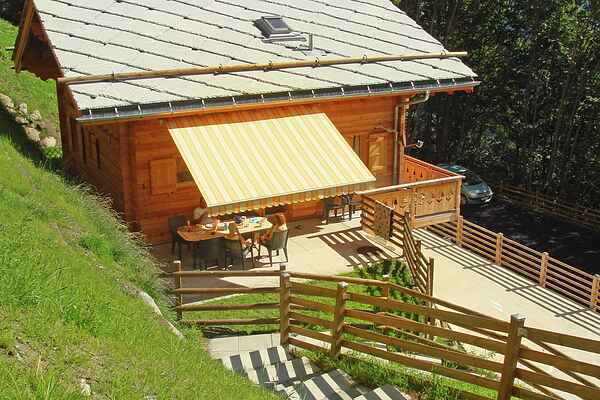 Beautiful and spacious luxury Chalet on a sunny hillside in the Quatre Vallées ski area with WiFi internet (free), open fireplace and sauna for 6 persons. Partial floor heating. Thanks to south-east facing balcony and terrace with full-length panoramic windows, the superbly equipped chalet offers spectacular views of the four peaks of the Valais Alps. Open plan living room with dining area and sofa area at fireplace. Modern and very well-equipped Poggenpohl kitchen. On the same floor is a double bedroom with en-suite bathroom (sink / shower / WC). In the basement are laundry room and sauna area with shower. In the attic is located on the mezzanine, an additional living area with sofa and TV, and 3 bedrooms (one with en-suite bathroom (toilet / bath / WC) and 1 bathroom. Cleaning costs are per person per week.